While Boyfriend worked on removing some radiators from our house this weekend, I went to my parents’ house and hung out with Mom. We did a bit of baking and she made this awesome pork dish for us. 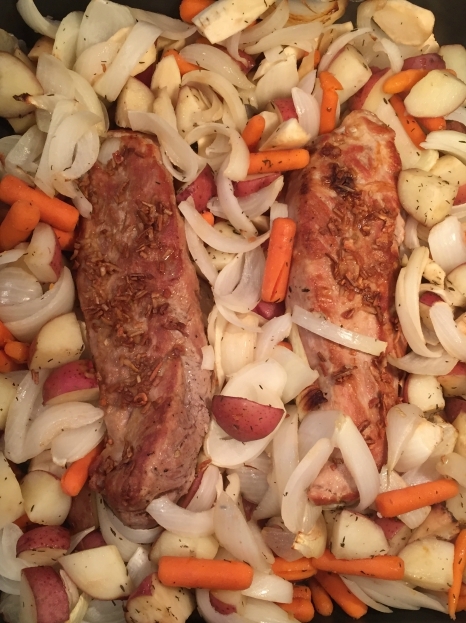 You can buy packages of pork tenderloin that usually have two pieces together, which makes this dish great for a dinner party or for sharing with someone else. My favorite part of a roast is all the vegetables, so Mom made sure to add in plenty of vegetables. 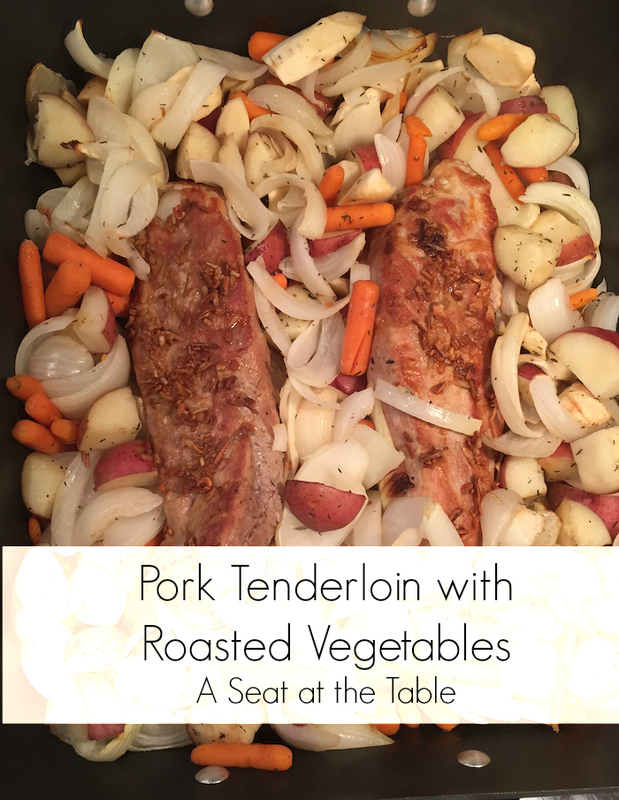 Since the vegetables take a little longer you’ll want to start roasting them before you sear the pork. You also don’t want to be shy with the seasonings since pork and potatoes can be a bit bland without some help. 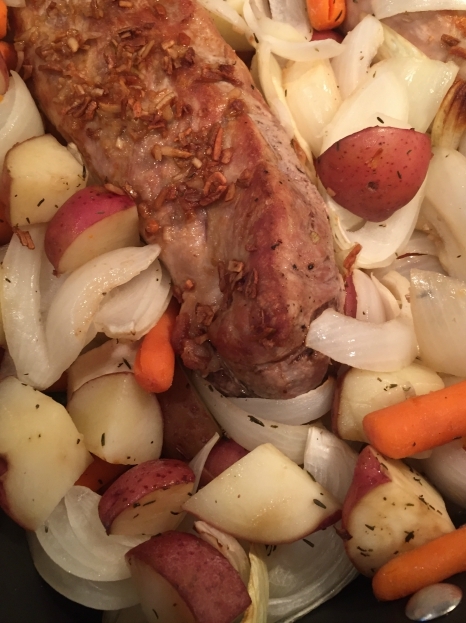 The onion soup mix helps add flavor and keeps the pork moist and tender. This is a great meal on it’s own, but served with a side salad and a little applesauce, and you’ll have quite the gourmet feast. In a large roasting pan, toss the vegetables with olive oil, thyme, salt, and pepper. Begin roasting while you sear the tenderloins. In a large pan, heat a little olive oil over high heat. Season the tenderloins with salt and pepper, and place in the hot pan. Let sear without moving for about 3-4 minutes on each side until there’s good color. When finished searing, place the tenderloins on top of the partially roasted vegetables. Mix the onion soup mix with one cup of water and pour over the pork and vegetables. Return the roasting pan to the oven and cook for another 30 minutes or until the pork is cooked through and the vegetables are tender. What’s your favorite way to eat pork?